Wear a piece of Ireland with this Carraig Donn Traditional Irish Aran Sweater made from the super soft merino wool. This handcrafted sweater is made from 100% Irish Merino wool which is famed for its high quality and softness. This sweater is sure to keep you warm and cosy all winter through. The Aran sweater is an enduring classic and these sweaters are made from the experts at Carraig Donn. This sweater is knitted with a honeycomb style and is suitable for men or ladies. Available in a selection of sizes and colors. Carraig Donn, Ireland's largest home based knitwear manufacturer, was developed from a traditional, family-owned business. Established in 1968, the Westport-based firm has grown into one of Ireland's foremost lifestyle and clothing brands. Nestled in the foothills of Croagh Patrick in the West of Ireland, the Carraig Donn design centre draws inspiration from the natural landscape surrounding it, to create an extensive range of knitwear. A passion for design combined with the finest raw materials has enabled Carraig Donn to perfect the art of Irish Knitwear, drawing on strong Celtic tradition for its quality clothing ranges. 100% Traditional Irish Merino Wool Aran Sweater - A must have for any wardrobe. 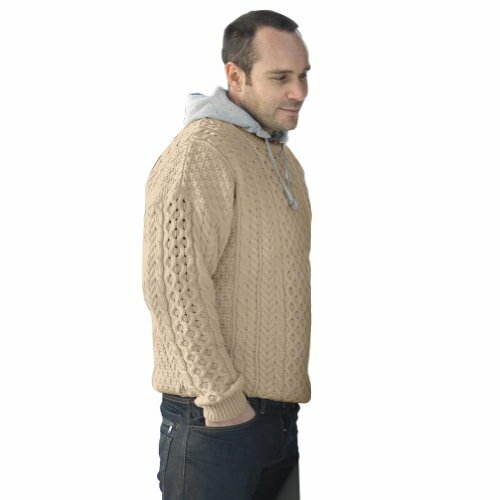 This sweater is sure to keep you warm and cosy all winter through and is knitted with a honeycomb style which is suitable for men or ladies.